Posted: Mon 06 Jun, 2011 12:01 am Post subject: Contest: Birthday Bash! To celebrate my birthday on June 7, myArmoury.com is having a birthday bash and giving away a mace! 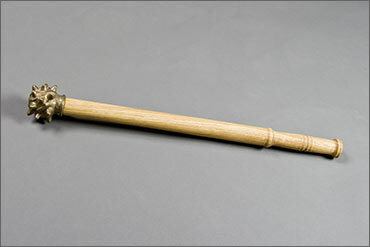 The bronze-headed mace offered up as a prize was generously donated by Tod from The English Cutler! The mace head is cast from bronze and is copied from a photograph of an original example dating to the 13th/14th century. It is mounted on an ash haft and is ready for bashing! It measures about 20 inches long and weighs in at 1.3 pounds. This deceptively simple weapon is capable of producing a shocking amount of damage. Hey, it's attractive, too. Please take a moment to visit the The English Cutler Web site and give Tod a big thanks for donating the prize. Contest entry is open until Monday July 4, 2011. First to cheers ! Happy birthday! Happy Birthday, Nathan. And thanks! Happy birthday in advance Nathan ('cause I'll probably forget it )! And a Joyeux Anniversaire to you Nathan. Happy Birthday, and good luck to everyone entering the contest! Here's to a "smashing" good time on your birthday! Happy birthday Nathan and thanks for the contest! This is so cool! Good luck everybody! Happy Birthday Nathan! I hope you get something sharp & collectible! Happy birthday Nathan and this is a great idea for a prize and many thanks to Tod for donating the prize. I've seen these before on Tod's site and I think these where also mentioned in one or more Topics here on " myArmoury " and they really look neat. 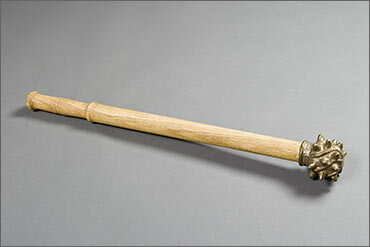 One can also buy the mace heads alone and mount them yourself in a DIY project and I think that I might like some of these as walking stick or hiking staff heads. Nice work by Tod on the haft also. This Birthday Bash contest was released on my birthday, maybe its good luck! And a Very Merry UnBirthday to the lucky winner! The church is close but the roads are icy; the tavern is far, I will walk carefully.